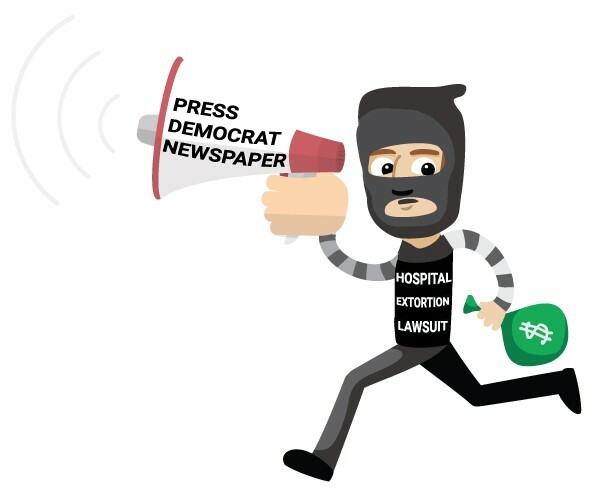 Why Did Press Democrat Run Extortionist Claims Against Hospital on Front Page? 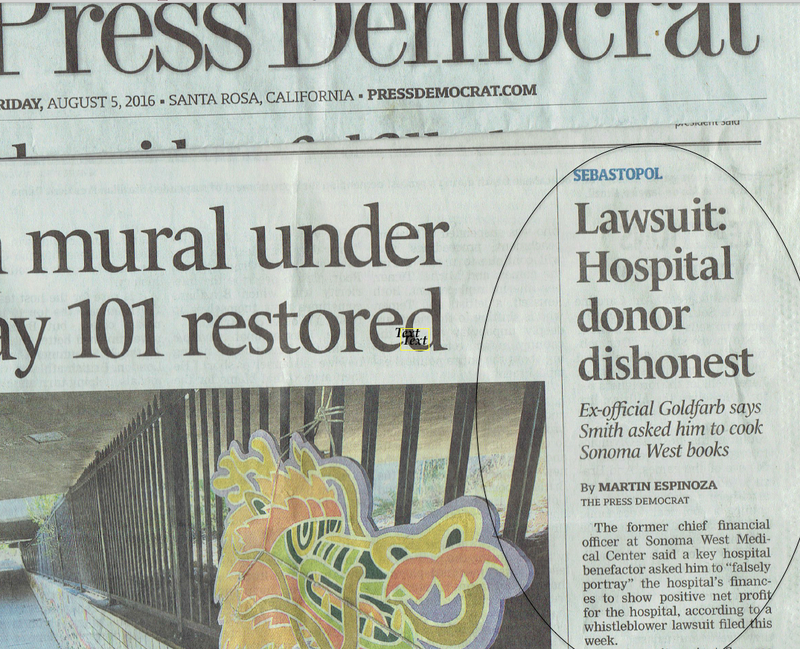 In one of the worst breaches of journalistic ethics by a major California newspaper in recent years, the Santa Rosa Press Democrat last week used its front page to smear the Sonoma West hospital and its largest philanthropist based upon unsubstantiated, easily-disprovable allegations by a disgruntled former employee bringing a shakedown lawsuit. Neither the article by reporter Martin Espinoza nor the lawsuit itself provided a shred of evidence to support the article’s reckless headlines. Espinoza noted that neither hospital chair Dan Smith nor the hospital itself could comment on pending litigation. Indeed, as any journalist knows, when a person or a hospital is slapped with a lawsuit, their attorneys require them to not talk to the press until their legal response is filed. Why did the Press Democrat not wait for a legal response to the incendiary allegations? Why instead did they choose to publish a one-sided story that did not come close to passing a journalistic sniff test for veracity? What was the rush to vilify Smith and disparage the struggling community hospital? In other words, the newspaper delivered the extortionist’s ransom note, price-included, while somehow still calling him a whistleblower. Any common sense analysis of the lawsuit (which I have fully read) shows the Press Democrat’s headlines to be misleading and irresponsible. The plain reading to a reader of the phrase “cook Sonoma West books” and the term “dishonest” means self-interested corruption. Smith and his wife, Joan Marler, have, as reporter Espinoza well knows, sacrificed most of their net worth, have gone massively into debt, and have had to sell the restaurant they’ve owned for a decade in order to come up with the $15 million in donated capital necessary to reopen and sustain the hospital and its life-saving emergency room. In addition, Smith has donated two years of his time without pay to manage the Herculean effort of being the first community hospital in California history to close and then reopen. Smith has also donated the electronic medical-records system and related support services for the new hospital. There have been no reports of harm done to a single patient since last November’s reopening of the small community hospital. SWMC’s reputation for personal, humane care remains identical to that of its predecessor, Palm Drive Hospital, which Consumer Reports in 2013 ranked as the safest hospital for patient outcomes not just in Sonoma County but in the entire state of California. On August 5, 2016, the afternoon this story appeared, I left a voicemail and sent a direct email to each of the top editors at the Santa Rosa Press Democrat asking for comment regarding the propriety of this article. I contacted Executive Editor Catherine Barnett, Managing Editor Ted Appel, and Local editor Steve Levin. “In my 37-year career as a professional journalist, I have never seen a major newspaper like yours smear a person on its front page, causing damage to an important struggling community institution, based on entirely unsubstantiated allegations by a disgruntled former employee. Nine days later, not one of the Press Democrat editors have responded to my request for comment. Nor has the newspaper published a letter I wrote voicing my criticism or anyone else’s letter on this subject. (Contact info for these editors and Martin Espinoza can be found here. Letters for publication can be sent to letters@PressDemocrat.com). 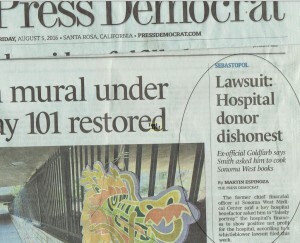 The Press Democrat (“PD”) and reporter Martin Espinoza’s coverage of the closing of Palm Drive and the struggle to reopen its life-saving emergency room that I, like thousands in West County have advocated for on behalf of the safety of our families and neighbors, has been unprofessionally biased from the start. Omitting critical information and cherry picking what side of the story is told has been standard practice, and has empowered a number of false narratives about the hospital. For instance, the above referenced letter suggests that reopening the hospital has been costly to taxpayers. In fact, unknown to any reader of the PD, the tax subsidy to the hospital is less than 10% of the losses related to reopening and keeping it open. More than 80% of the cost has been personally financed by benefactor Dan Smith. Also curiously missing from the PD’s frequent coverage of a tea party-like effort for a group of citizens to “detach” from the Palm Drive Hospital District is the overarching fact that taxpayers in the detached District would continue to be on the hook for the past decade’s bonds that were floated, after widespread voter approval, to support the hospital. In fact, the public has not been informed by the newspaper that taxpayers will continue to pay the same tax for this hospital’s debt whether a hospital stays open or not. Why, one wonders, does the shakedown lawsuit story mention the $3 million that Smith and Marler donated recently, but conveniently neglects to mention that these funds come after $12 million of additional Smith/Marler donated funds. A curious reporting error by reporter Espinoza late last year referred to Smith as a “billionaire,” when, in fact, Smith’s wealth has never been but a tiny fraction of a billion dollars. It is rare for an experienced reporter like Marin Espinoza to err by a factor of 100,. And I have never seen the PD incorrectly refer to any other business person as a billionaire who was not one. The false impression, of course, was that funding the hospital was pocket change to Smith, instead of a sacrifice that has put he and his wife into deep debit and forced them to sell their assets. The PD ran a correction of Espinoza’s error on its website, which can be seen at the bottom of this article here, but how many readers who are provided false information like this in print ever read such corrections online? The Press Democrat has irresponsibly damaged the reputation of the Sonoma West hospital by publishing articles that would never written about the other major hospitals in the region, which are all owned by larger, more powerful hospital corporations. In my nine years reading the newspaper, I cannot recall them ever reporting on a lawsuit by either a patient, or a disgruntled former employee of these hospitals–much less use its front page to promote one.